If you are growing your tomatoes from seeds, it’s best practice to ensure you don’t crowd the tomato seedlings in their pots. Overcrowded seeds can hinder their growth, which can add additional stress on the seedling, and ultimately lead to disease further down the track. The seeds can initially be planted in any small container from a yoghurt cup to a juice carton, as long as there is plenty of drainage. The seedlings should then be transferred into individual pots as soon as their true leaves start to appear. Tomatoes love light, so make sure you place them in a sunny spot that will absorb light for at least 6 to 8 hours a day. This might be a bit tricker in the winter months so if you are growing them through these months it’s best to use artificial plant lighting. Allowing the seedlings to absorb as much light as possible will help the plants to grow stocky, as opposed to spindly, and ultimately bear more tomatoes. To develop strong and sturdy stems, tomato plants need to be able to move freely and sway in the breeze. This is easy to achieve if you are growing your plants in a garden outdoors, but if you have the plants in a greenhouse you can create a similar effect by positioning a fan close to them and turning it on for 10-15 minutes, a couple of times a day. Prepare the soil by digging through some organic matter, water well then finish with organically based fish fertiliser such as Charlie Carp’s All Purpose liquid or Certified Premium Organic liquid. 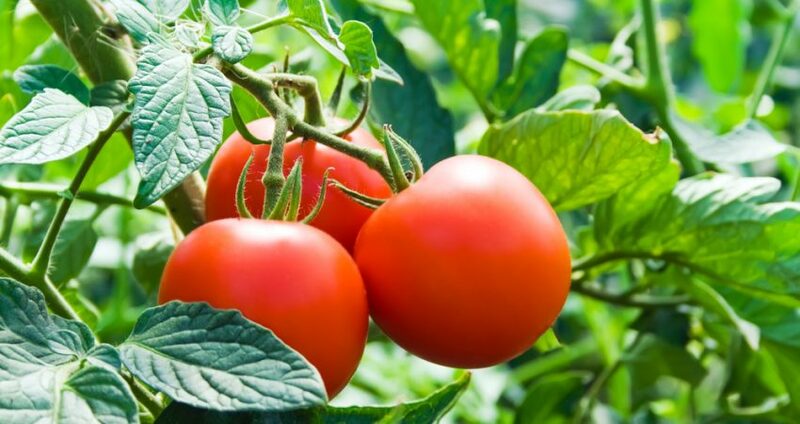 We all know that tomatoes love the heat, this means not only do they lap up direct heat from the air but they also like a warm soil to grow in. You can increase the temperature of the soil by covering it with black plastic for a few weeks before the plants are due to be transferred from pots to the soil. The warmer soil will help to bring out the first tomatoes a little earlier. Once your seedlings have sprouted and are ready to be transferred to the garden, make sure you plant the stems deeper than they were in the pots. By planting them deeper you allow roots to grow from the stems which will make them grow sturdier and generally stronger. You can either dig a deeper hole to plant them or alternatively you can dig a shallower trench and place them in sideways. They will then naturally grow upwards, towards the light and still have a more solid root. Tomatoes grow at a rapid rate so need regular feeding and watering throughout their lifespan. They will require generous watering in the first few days after planting then regular watering in the morning is recommended. Watering at irregular intervals can lead to rotting and cracking of the tomatoes. You can lessen the amount you water them as the fruit begins to ripen. You should apply a good quality slow release fertiliser , such as Charlie Carp Fishworks For Gardens, after transplanting then complement with organically based fish fertiliser such as Charlie Carp’s All Purpose liquid or Certified Premium Organic liquid . Always read and stick to the recommended rates as every fertiliser is different. Once your tomato plant has reached over 1 metre tall it’s a good idea to remove all the leaves under 30cm. This is because these low laying leaves are the most likely to develop a problem with fungus that can spread throughout the plant. Fungal diseases can be fatal for a tomato plant and ruin your harvest. There are basically two types of tomato plants, determinate and indeterminate plants. Determinate tomato plants will grow to a certain height, once the maximum height is reached the tomatoes will set and ripen all at once. Indeterminate tomato plants will keep reaching for the sun and grow taller and taller. You can harvest the likes of big beef tomatoes from these plants throughout the growing season. Here at Charlie Carp we take the art of growing juicy, healthy fruit and vegetables very seriously. If you have any questions about what fertiliser is best to use on your vegetable garden or indeed anywhere in your garden, please feel free to contact us.